“As President of the Sunway College Student Council, I am not sure how much I could, or would even try to change Sunway College as it is already a great place. With a request to his council members, “Don’t walk in front of me, I may not follow; don’t walk behind me, I may not lead, just walk beside me and be my friend. Nothing is perfect, there is room for everything within us and around us. I believe we will be able to contribute to the campus and serve the students bearing in mind our common goal”, says Tee who is currently in his first year in the Victoria University Bachelor of Business programme. 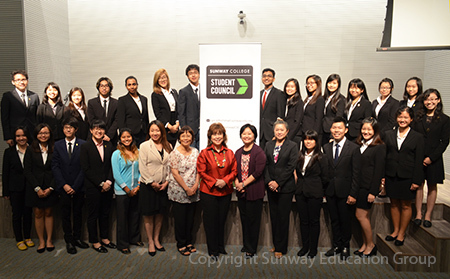 Secretary Ryan Lee, currently in the Canadian International Matriculation Programme (CIMP) designed the SCC’s new logo. The rationale for the design, he said inspired by nature especially bees and the way they work together for the good of the hive, which at first was four parallelograms and then evolved into the current logo which resembles an arrow. “The arrow, which points to the right signifies that the SCC is always moving forward, indicating that we are visionaries“, said Lee. 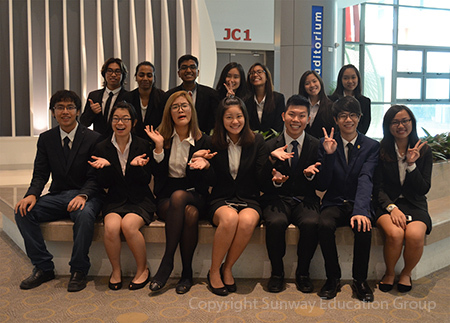 Together with Tee and Lee, the Sunway College Student Council is made up of 15 students from the various pre-university and Victoria University programmes.